Red cabbage is very high in antioxidants, specifically anthocyanins and indoles. From these are where it gets that wonderful color. Red cabbage is known as being a key food in cancer prevention. Red cabbage is high in fiber. Red cabbage is high in Vitamin C. Vitamin C is crucial to our immune system. Eating cabbage gives a boost to the immune system. Red cabbage is high in the amino acid glutamine. Glutamine is beneficial for gut and gastrointestinal health. 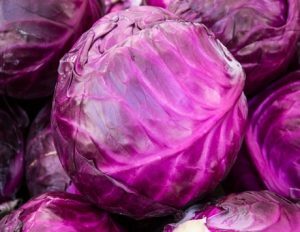 Red cabbage contains calcium, magnesium, manganese, and other important minerals which contribute to bone health, are anti-inflammatory and help fight against arthritis and osteoporosis. 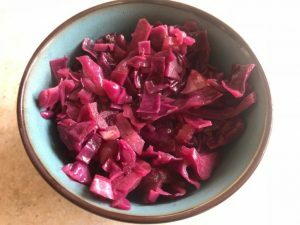 Other essential components of red cabbage include thiamin, iron, riboflavin, folate, vitamin K, B vitamins, and potassium. In a dutch oven or large saucepan, combine all ingredients. Stir together. Turn stove to high and bring ingredients to a boil. Reduce heat to medium low, cover, and cook until liquid is evaporated and cabbage is tender, stirring occasionally. Cooking time typically averages 45-55 minutes. Easy peasy! Enjoy!